Slow, somewhat dull film that gradually, almost painstakingly picks up in its second half when things finally start to happen and the camera stops lingering so much on shots of people just washing dishes or eating or chasing pigeons. It’s a nice, if not simple, looking film at least, shot all in mostly one location, and the slow editing is refreshing, though, again, a little excessive, with some shots just continuing on and on and on. Drove me crazy, though more often to sleep. And some of the dialogue during these long shots is so uninteresting. Just get to it already, damn it! 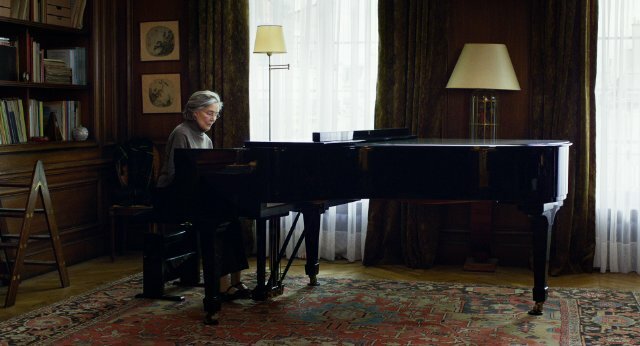 The acting was good at least, especially from the older woman here Emmanuelle Riva who really deserved the Oscar win over Jennifer Lawrence. Unquestionably. Still, it’s not a very exciting movie, though, again, the second half is much, much more interesting than the first. And disturbing. And sad. The film is well made at least. There’s an obvious strong, invisible hand guiding the thing, even if some of it does feel bloated. And the editing, god. I’m all for thoughtful, lingering shots and all that, but come on. Even I have my limits. The few cuts, along with the boring dialogue and relatively plot-less nature of the thing, make for a rather dull first half, even after the central “problem” is revealed. Luckily once things start really going to hell it gets much more interesting, mostly thanks to some fine performances and an all around feeling of horror and sadness that only continues to grow as the film progresses. The scenes of the woman **SPOILERS** screaming “pain! pain!” at nothing while lying in bed **END SPOILERS** were particularly effective, as was the ending which was just about the most perfect way a film such as this could end. Scary, scary stuff. And, though I didn’t quite understand all the imagery and metaphors the film was going for, I think I got the gist. Overall, not a bad film, just slow and a touch overrated. I knew going into it what kind of film it would be, but I had no idea the first half would be as dull as it was. That’s not to say the film is bad or not worth watching as the second half is certainly much more interesting and thoughtful and revelatory, but it almost felt like a chore to finally get to. Still, you may have a different experience and end up not actually minding the long, slow first hour. Who knows? The film has a strong, unique perspective at least that is rarely expressed in films today, and is well made for the most part. And boy does it not make me look forward to growing old, assuming I will, that is. God. What a nightmare. Anyway, not terrible, but not as good as you’ve probably heard. Maybe watch after a good night’s sleep, or lots of coffee. Preferably both.